It basically shows that he was able to create an optimum surface with the least stress, but he ended up analytically describing the surface with three functions. The final roof carries a lot of stress in it. I still think Williams made the right decision: the aesthetic qualities of the roof are as important as its structural performance. jon, i'm curious... how did you go from the grid where you used the sdrzigzagcurves command to the mesh that was the rhino model? 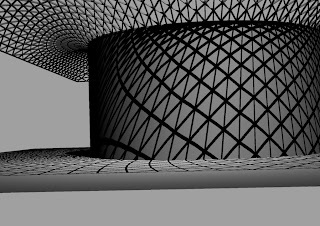 I recall I had a curve network (where all curves are split at intersections) to mesh routine, but I've just looked and it doesn't seem to be available in the current plug-ins. I'll add it back shortly. Note also the most recent builds of SDR have direct curve network force density without converting to mesh. I'm nearly there with a Rhino common build of the plug-ins for v5 (and v4 with Grasshopper v0.7.0037+) and hope to revisit and repost many of these early examples shortly. Hi, I'm new to grasshopper, which I found is very interesting. 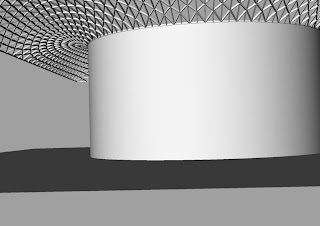 I'm wondering how the flat patterned mesh projected to the surface has been created? This particular blog post was done when Grasshopper was in it's infancy. I used some manual techniques to generate the base mesh on a flat plane, and then projected the mesh vertex up onto the surface. I haven't really found time to make an automatic radial mesher for this scenario. Hope you enjoy Grasshopper. Hello, Jon, I'm working for a thesis for the renovation of the historical courts by adding a roof on it, and I chose Great Court in British Museum. I would like to ask you how you have found the dimension infomation of the great court? My relaxation doesn't give exact shape found by designers, but it's reasonably close. Great example about ETFE roofing.I'm always glad about the museum, all the historical value makes me feel my knowledge and I feel that I grow as a human.